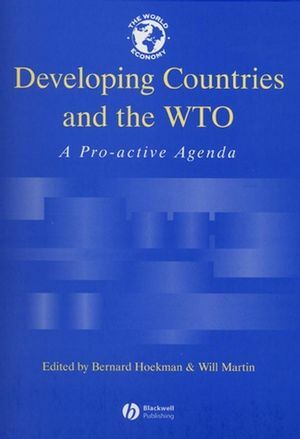 This volume brings together a selection of papers that were prepared as background analyses for a collaborative research capacity-building project, focusing on the WTO negotiating agenda. Contributors review the results of the Uruguay Round negotiations, discuss developing country concerns relating to the operation of the WTO and assess implementation of WTO agreements. Contributors quantify the potential benefits of further global liberalization of access to markets for industrial and agricultural products, and assess the relative merits of expanding multilateral disciplines into new areas such as investment, competition, and labor and environmental policies. Bernard Hoekman is Research Manager of the International Trade group in the Development Research Group of the World Bank. Will Martin is the Lead Economist in the World Bank’s Development Economics Research Group (DECRG). 1. Developing Countries and the WTO Negotiations: R. Chadha (University of Delhi), W. Martin (World Bank), A. Oyejide (University if Ibadan and African Economic Consortium), Mari Pangestu (Centre for International and Strategic Studies, Jakarta), D. Tussie (Latin American Trade Network and FLACSO) and J. Zarrouk (Arab Monetary Fund). 2. Two Principles for the Next Round: J. E. Stiglitz (World Bank). 3. Liberalising Agriculture and Manufacturers: T. W. Hertel (Purdue University) and W. Martin (World Bank). 4. Developing Countries in the New Round of GATS: A. Mattoo (World Bank). 5. Improving Africa's Participation in the WTO: R. Blackhurst (Graduate Institute of International Studies, Geneva), B. Lyakurwa (African Economic Research Consortium) and A. Oyejide (University of Ibadan). 6. Implementation of Uruguay Round Commitments: J. M. Finger (World Bank) and P. Schuler (University of Maryland). 7. WTO Dispute Settlement: B. M. Hoekman (World Bank and CEPR) and P. C. Mavroidis (University of Neuchatel). 8. Industrial Policy and the WTO: B. Bora (UNCTAD and Flinders University), P. J. Lloyd (University of Melbourne) and M. Pangestu (Centre for Strategic and International Studies, Jakarta). 9. Subsidiarity and the Governance Challenges: J. Rollo and A. Winters (both Sussex University). 10. Technical Regulations and Customs Procedures: P.A. Messerlin (Institut d'Etudes Politiques, Paris) and J. Zarrouk (Arab Monetary Fund). 11. Competition and Policy in Developing Countries: K.E. Maskus (University of Colorado) and M. Lahouel (University of Tunis III). 12. Maximising the Benefits of Trade Policy Review: J. F. Francois (Tinbergen Institute and CEPR). 13. From TRIM's to a WTO Agreement on Investment? : B. Hoekman (World Bank) and K. Saggi (Southern Methodist University). 14. Bringing Discipline to Agriculural Policy via the WTO: K. Anderson (University of Adelaide).